Where does all this controversy leave us five centuries later? A leader with Presbyterian roots and EMC membership shares his thoughts. I was baptised as an infant. Don’t be too shocked, please. I was rebaptized as an adult. But my early life was informed by my parents’ commitment to the Presbyterian Church. It sent them as missionaries to the Congo, later called Zaire, for many of my formative years. I have missionaries on both sides of my family, going back four generations on Dad’s side and five on Mom’s. My wife Sharon Hildebrand and I met serving in Christian missions in Africa, she with MCC and I with the southern Presbyterians. This intertwines my history with the experiences of reformers John Knox and Menno Simons, and it raises questions for me and others today. Knox (c.1505-1572) was a founder of the Reformation in Scotland as it broke from the Roman Catholic tradition in 1560. Simons (1496-1561) was, of course, a key leader of the Anabaptist-Mennonite tradition in which the EMC has a place. He began as a priest in Friesland in what is now the Netherlands. Both priests found that political and cultural circumstances, as well as inner convictions, pushed them to consider the Scriptures more highly than the traditions and teachings of the Roman Catholic Church. Both were influenced by the Reformation activities of Martin Luther in Germany and John Calvin in Switzerland. Simons was converted and broke with the more mainstream reformers, especially on the issues of believers’ baptism and participation in civil government. Knox came from Great Britain where Protestant forces, especially Henry VIII’s Church of England, contended with Roman Catholics in government; this showed the political influence of the French and the Spanish in England’s royal family. John Knox was influenced by his association with Scottish reformers Patrick Hamilton and George Wishart, both of whom were martyred for their Protestant teaching in the first half of the 16th century. Knox was actually an armed bodyguard for Wishart, and was taken prisoner after the French put down an armed uprising. This attack was at the request of Mary of Guise, the Catholic mother of Mary Queen of Scots, and the Roman Catholic regent of Scotland. Knox was forced to row galleys for the French for almost two years. Later exiled to England, Knox became a priest within the Church of England and was one of six chaplains for the young King Edward VI. In the early 1550s, Knox was offered various posts to keep him under the thumb of Edward’s in-fighting regents. In 1554 he left Great Britain for the continent. For the next five years Knox developed his doctrines of Protestantism, focusing on “idolaters”—meaning Roman Catholics—and women as secular rulers. He published “The First Blast of the Trumpet Against the Monstrous Regiment of Women” largely against Mary of Guise in Scotland and English Queen Mary I, the daughter of Henry VIII and Katherine of Aragon. Hundreds of reformers were executed under “Bloody Mary” during her reign from 1553-1558. From 1560 to his death, Knox was a renowned preacher in Scotland as the country continued to develop its commitment to Protestantism and against Catholicism. Knox was part of the impetus toward Scottish emphasis on preaching, reading and singing in “the Kirk” (the Church) based on the Word of God. Even before he returned to Scotland, Knox had written letters to the Scottish churches warning about idolatrous Catholicism and what he called heresies. He included Arminianism, which emphasizes that people are free to choose either to follow Jesus or to reject him. To Knox, this said that people control their eternal destiny and are justified by works rather than faith. In turn, Simons and other Anabaptists saw the doctrine of predestination as leading to moral laxness for individuals and for the church. 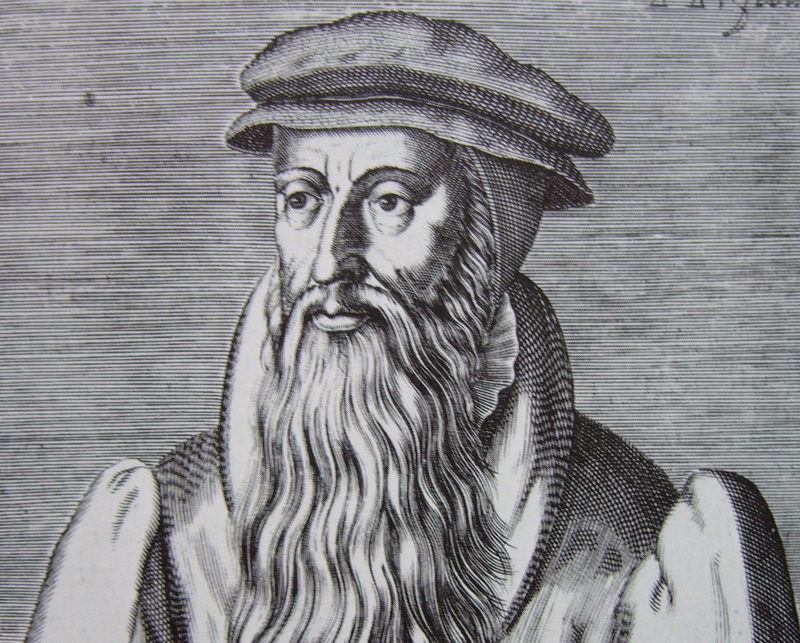 To be fair, Richard Kyle points out that Anabaptist was a “generic label for all kinds of nonconformity, virtually synonymous with fanaticism or heresy.” Knox may not have referred to the strain of Anabaptism that would eventually respect Menno Simons’ teachings, although he touches on several Anabaptist distinctives. The Anabaptist took the book and left. Knox regretted that he had not kept the book and reported the Anabaptist. This failure could have created serious problems for Knox. Yet even years later, Knox would not mention his name, which could have led to the Anabaptist’s death. Obviously, this “Anabaptist” was not in the sola scriptura tradition of Simons, Luther, and others. However, most major reformers and Roman Catholics saw it as dangerous heresy to reject the sacrament of infant baptism. Anabaptists, according to Knox, saw baptism as non-sacramental, a testimony of faith, not itself a part of the process of salvation. Knox and most reformers agreed that baptism did not confer salvation, but Knox asserted that it was not necessary to be rebaptized. Where does all this controversy leave us five centuries later? Debate continues about predestination versus free will, though with perhaps more charity. Likewise, Christ’s Church has developed more loving attitudes, rather than executing those with whom we don’t agree. We may still have a way to go to conform to the Sermon on the Mount in the areas of anger and the desire to call each other various kinds of fools (Matt. 5:21-22). As for baptism, it would be nice to think that the Church is more tolerant now than in the Reformation. However, in Zaire as a young adult I requested to be rebaptized and saw the anguish of a Presbyterian colleague from Scotland whose mission authorities forbade him to take part in the ceremony. Knox and the major Reformers thought that Christians should take part in civil government. Simons and many other Anabaptists thought that separation from the world was required of followers of Christ. Today, the nature of government in modern democracies seems to require that good people not be separate from the way government is done. “In the world, but not of the world” was easier to discern in the past when rulers came from distinct strata of society and Christian leaders too often confused secular power and religious authority. Today, citizens of all classes may ascend to political power, and Christian integrity should be shown in the service of politics as well in as our call to be Christ’s witnesses and his hands and feet in the world. In spite of Reformation conflicts in the past, we should continue to progress into a more perfect expression of Christ’s commandment and warning: “By this everyone will know that you are my disciples, if you love one another” (John 13:35). Bill Rambo (Saturday Night Church), BA, BS, is a high school teacher in Winnipeg. He grew up in The Democratic Republic of the Congo/Zaire and in the United States. After marrying Sharon, he has been rooted in Landmark, Man., for more than a quarter century. However, he still cheers for the Denver Broncos as well as the Bombers. He has served on the EMC Board of Church Ministries and currently serves on its Education Committee.